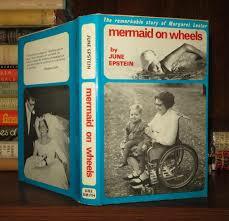 Mermaid on wheels is biography of Margret, an Australian lady who became paralyzed due to diving in shallow water. The patients in the acute ward were mostly a collection of both sexes of different ages, and from all walks of life. Many of the men were there as a result of car accidents. Adrien Black, a father of six, had fractured hi neck in a diving accident. Alam Yeomans a jockey had suffered injuries in a pile up of horses on the racetrack. There was a truck driver, there were university students, there was a housewife. Into this company one day was admitted a young schoolboy. Paraplegic as a result of cancer. He had been admitted into the Spinal Center so that not to have been in a ward for the old and dying. For, no matter how severe the disabilities in Ward Seven, there was an atmosphere of hope and encouragement, a feeling of life beginning to flow forwards again instead of slowly ebbing away. And there was laughter. So Bruce was brought in and put in the bed opposite Margaret. Every day his mother and sister came to comfort him. Although his condition was rapidly deteriorating, the mother refused to give up hope, and kept a cheerful face. Greta, secure in the knowledge that Margaret was alive and would soon be well, was deeply moved. The three women often talked together, and from her mother Margaret learnt Bruce’s story. As a robust twelve – year – old, avidly keen on sport, he had one day complained of a mild pain in his side. This was the beginning. An operation was necessary, and after it for a while he attended school normally. Then the cancer recurred, affecting his legs so that he was put in a wheelchair. But he refused to stay in it. He taught himself to walk again, and once more recovered to the extent of being able to go back to school. He was then a pupil of Geelong Grammer School, due for the wonderful years at Timbertop, the mountain annexe where the boys learnt bush craft. Bruce was not well enough to cope with such activities. He remained at the main school at Geelong; bitterly disappointed though he was, he made no fuss. After that he rapidly went downhill, and soon there was nothing for it but hospital again. Once or twice, in spite of his desperate condition, his mother had him taken home on an operation stretcher trolley in an ambulance. He had two wonderful weekends in the garden at home, shooting at the magnolia buds with his air gun, his beloved dog Timmy panting on another trolley, level with his face. ‘I wish I knew what was the matter with me’, he said wistfully one night to his aunt, while his mother was out of the ward foe a few minutes. She turned away, fumbling in his bedside drawer for something to talk about. She found a pair of small keys. ‘Look what I’ve found’, she said brightly. ‘Whatever are these for’? The next day he died. It was a distressing and deeply moving experience for everyone in the ward. Only later did Margarte, thinking about it all, realize that not once had any of them heard Bruce whimper or complain.